The holiday season is in full swing, and fun holiday gift exchanges such as White Elephants and Secret Santas are going on in workplaces, between friends, and even among families! Right now, you can participate in a fun online White Elephant gift exchange through PepsiMoji’s Facebook page! Playing this fun holiday gift exchange game is so simple! Just visit the PepsiMoji Holiday White Elephant Facebook page and click on the ‘Send Message’ button at the top of the page. You will receive additional information from the bot via messenger. You can invite your friends to play too! When you do, you can ‘steal’ their White Elephant gifts just as you would during a White Elephant party you attend in person. People who have already participated in this PepsiMoji White Elephant gift exchange have received gifts such as a snow tube, a sweater, stickers, Pepsi points, and more! Remember, the more people you recruit to play, the more gift options you can steal from other participants. Don’t feel bad about snatching up other people’s gifts- that is the whole point of this type of holiday gift exchange. 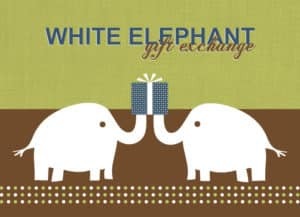 Get started now to take part in this awesome White Elephant and receive a great prize that you love!